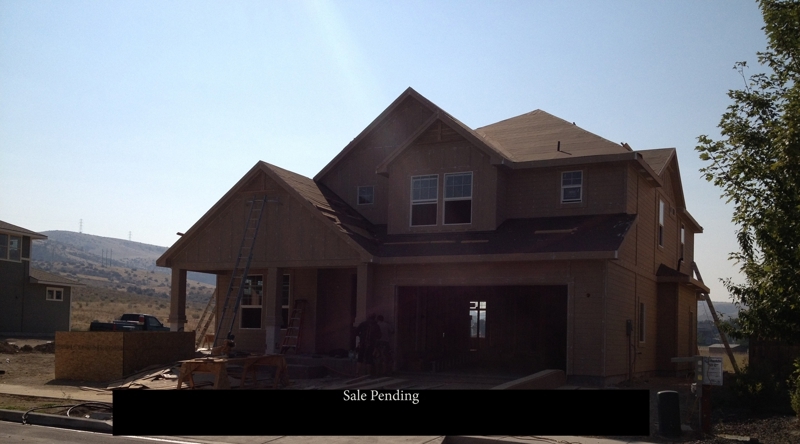 New Construction in Hidden Springs - Build Your Own Dream Home! The inventory in Hidden Springs has continued to shrink and with prices recovering, new construction has finally taken off again! Most of the available lots remaining in the Dry Creek phase of Hidden Springs are located on 14th Avenue and are owned by Star Enterprises. The builder is John McBride/Star Enterprises, formally of Capitol Building Company, and the floorplans are also primarily those used under the umbrella of Capitol Building Co. The following two photos are of homes currently under construction (both are pre-sold, build to suit projects and I represent the buyers). The lots along the east side of 14th are some of the best lots remaining in the community as they back to open space, with foothill views. There is also a neighborhood trail that winds down along the creek and which will connect to other neighborhood nature trails. The east facing backyards are also a hot commodity, providing shaded afternoon patios. The standard finishes for this builder are upgraded (high energy efficiency, granite, hardwoods, conditioned crawl spaces, custom cabinets, tiled master baths). A collection of floorplans are available which can be modified to suit your lifestyle. The lots along the east side of 14th carry a premium for the views, but there are also additional alley-load lots and floorplans available. For the properties currently under construction and on a premium lot, prices have ranged from roughly $310,000 for 2300 square feet to $365,000 for just shy of 3400 square feet (prices include a full landscape plan). For questions about buyer representation on new construction in Hidden Springs, please don't hestitate to contact me for assistance. Pending sale, scheduled to close mid-October. I also maintain a blog packed with information about living in Hidden Springs and real estate market data. For the most current inventory information for Hidden Springs Idaho, I'm including the May sale data below. There were 4 closings in Hidden Springs in the month of May with an average sale price of $418,725 ($116 per sq ft). Additionally, there were 7 new pending sales in May, averaging $350,385 on sale price ($114 per sq ft). Current Hidden Springs Homes for Sale has dwindled considerably to 26 active listings including both existing homes and new construction (Average list price at $331,418 / $116 per sq ft). As is apparent from the sale data above, the primary demand in Hidden Springs has been for home exceeding 2400 sq ft and under $425,000 in price. There is less than a 2 month supply of homes fitting that criteria, creating some of the best selling conditions Hidden Springs sellers have seen for several years if priced well and perfectly presented. We are experts in the Hidden Springs market and look forward to helping you. A driving video tour of Hidden Springs Idaho can be accessed below. The video tour is a good representation of housing styles within the community and you'll see many neighborhood amenities in the tour including the Dry Creek Mercantile, Hidden Springs barns, open space, parks, etc.